A created a new Peaty / Verdant Seed Farm to try out a new concept that I think could help newer players. The main thing that really makes this farm different is that I am constructing reservable storage & machine spaces around the outer edge. This makes it easy to farm for a bit without running back to your base. Each unit comes with 18 storage cubes, 1 compactor w/ 1 advanced coil and 2 spark generators, and 1 extractor with 2 advanced coils. I may change the extractor setup to 2 extractors. The machines are there to do a little work while you are farming. I got this idea while staring at the storage in the regen consortium farms and wishing I had access to it. 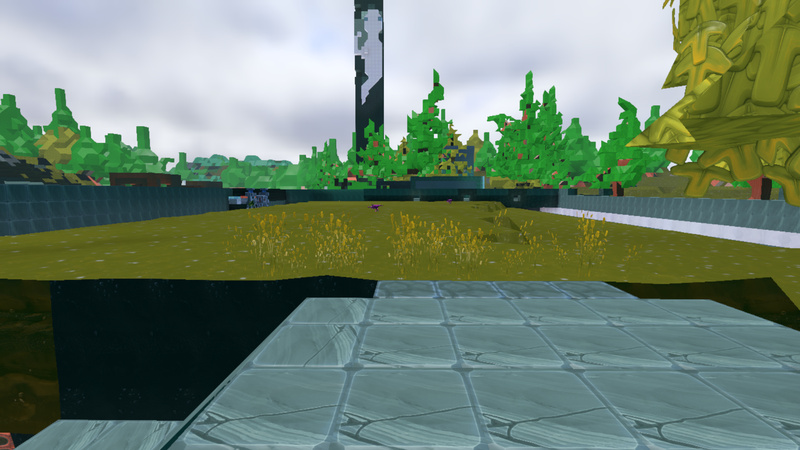 There is a portal from the farm to 2nd farm on Tana that has barbed grass on top instead of verdant. 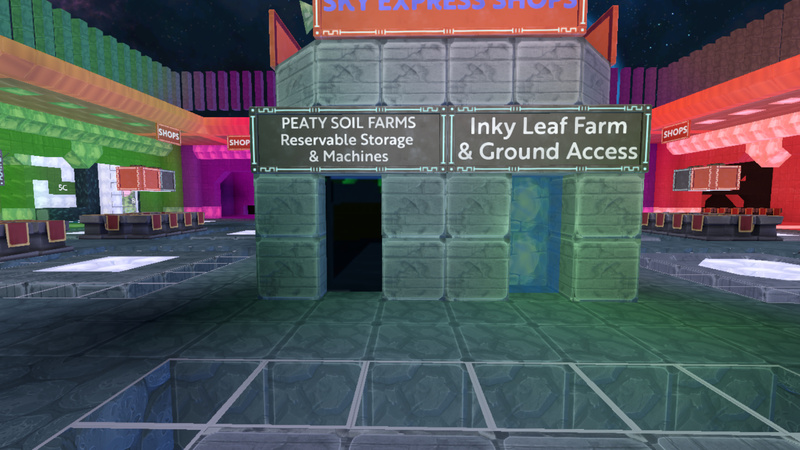 The farm can be accessed through the Sky Express Shops that have a portal about the Lambliss gate at PS Biitula, in the central Lengendville Hub, and one in the iLLuminaughty Trior Co-op. If the concept is popular, I will keep expanding it. I’m planning to add regen bombs, speed brews, and AOE shovels once I identify a good supply. Most farms sell these at prices that are too high in my opinion. I’m looking for feedback and am still open to any ideas about how to make this useful. I know there are tons of Peaty farms already. Amazing idea, I love this concept and would love to reserve a space at the peaty farm. In my opinion you are absolutely right about the are tools being too high in game. I love that you are offering machines so we can compact etc. While we farm. 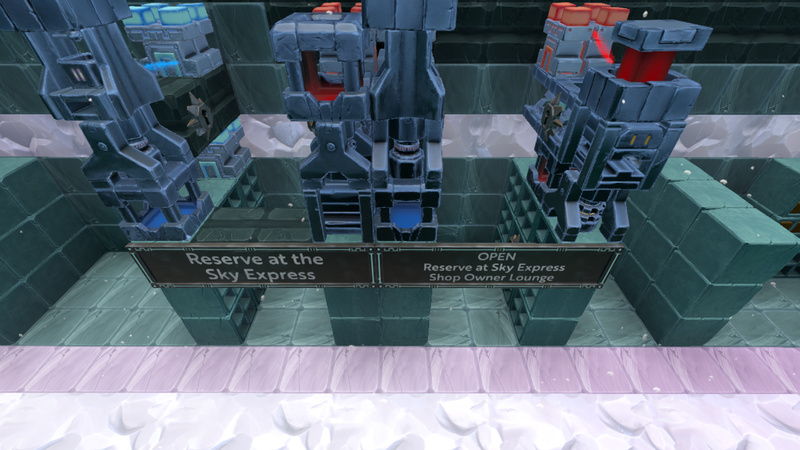 My in game name is Rosa, how do I reserve a spot. Thank you. I would reserve a spot at any farm you make. I’ll change one of the signs to mark one for you, but to get you access to the equipment we have to find each other and become friends. I hope one day they will let us at least share access to any guildmate, unfriended or not and that would make this easier. Are you in the game now. I am at the moment. I also figured out how to strealine the process. In each “booth” there is a guild book for a faction that you can join to use that booth. Go ahead and join it to get access to the booth. Next time I’m on, I’ll make sure you are alone in the faction, or any alts or friends you want to share with have joined and then shut down the auto-invite. This way, we don’t have to meet up to get you in. Both the first 2 booths are set up and ready to go for anyone to claim them. I’ll do this until I hit the faction limit. I discovered that there is one more step in process. After you join the guild faction, I have to make you a worker. It’s still better than having to be online at the exact same time. Awesome Thank you. I will come sign up for a faction sometime today. I signed up in booth one today. Thankyou. Thanks, it’s been a busy day but as soon as I get online and change I’ll msg you. Use advanced locks. They work great for this. You’re good to go. I also primed the spark generators in your booth with about 30k spark to make sure you can put that compactor to work quickly. I have them installed in the booths already. Because I can have trouble meeting up with people, I’m using guild factions. Each booth has 4 locks belonging to a faction of the Peat farm guild. If someone stops by and joins the faction at the booth then all I have to do is make them a worker and they can use anything the locks are attached to. It would be smoother if I could do it without having to assign worker permissions.